On the surface, avant hiphop, like any heady art form, takes itself too seriously. But that won't happen when rapper why?, fellow emcee Doseone and producer odd nosdam perform as cLOUDDEAD at First Avenue on Saturday night. "We do a little greased-up ballerina pig dance, just as an interlude to our sets," said why? in a telephone interview last week. Then, "we have an Edison phonograph with wax cylinders. We pretty much just crank it up, let it go and we rap over the instrumentals." Trying to see through these Cincinnati rap mavericks can prove difficult work. With a sound that includes power tool arpeggios, space melodies and a perpetually nasal, sing-song rap style, some in hiphop's strongly classicist underground have stopped trying. 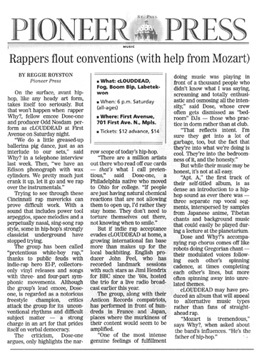 The group has been called "pretentious white-boy rap," thanks to public feuds with indie-rap hero El-P, collectors-only vinyl releases and songs with three- and four-part symphonic movements. Although the group's lead emcee, Doseone, is regarded as a notorious freestyle champion, critics attack the group for its unconventional rhythms and difficult subject matter-- a strong charge in an art form that prides itself on verbal democracy. The criticism, Doseone argues, only highlights the narrow scope of today's hip-hop. "There are a million artists out there who read off cue cards-- that's what I call pretentious," said Doseone, a Philadelphia native who moved to Ohio for college. "If people are just having natural chemical reactions that are not allowing them to open up, I'd rather they stay home. They don't need to torture themselves out there, not knowing when to smile." But if rap acceptance evades cLOUDDEAD at home, a growing international fan base more than makes up for the local backbiting. English producer John Peel, who has recorded landmark sessions with such starts as Jimi Hendrix for the BBC since the '60s, hosted the trio for a live radio broadcast earlier this year. The groups, along with their Anticon Records compatriots, has performed in front of hundreds in France and Japan, places where the murkiness of their content would seem to be amplified. "One of the most intense genuine feelings of fulfillment doing music was playing in front of a thousand people who didn't know what I was saying, screaming and totally enthusiastic and osmosing all the intensity," said Dose, whose crew often gets dismissed as "bedroom" DJs-- those who practice in a dorm rather than at a club. "That reflects intent. I'm sure they get into a lot of garbage, too, but the fact that they're into what we're doing is cool. They're into the bedroomness of it, and the honesty." But while their music may be honest, it's not at all easy. "Apt. A," the first track of their self-titled album, is as dense an introduction to a hip-hop sound as ever there was-- three separate rap vocal segments, interspersed by samples from Japanese anime, Tibetan chants and background music that could easily be played during a lecture at the planetarium. Dose and why? 's accompanying rap chorus comes off like robots doing Gregorian chant-- their modulated voices following each other's spinning cadence, at times completing each other's lines, but more often spinning away into unrelated themes. cLOUDDEAD may have produced an album that will appeal to alternative music types rather than fans of straight-ahead rap. "Mozart is tremendous," says why?, when asked about the band's influences. "He's the father of hip-hop."